What we can all learn about the art of business from Pepsi’s epic war with Coke and Apple’s public dust-ups with Microsoft. Not long ago I spoke with a group of teenagers about branding. Soon enough the subject turned toward Coca-Cola. For my own curiosity, I asked them who they considered Coke’s main enemy. Of course, I was expecting them to state the obvious–Pepsi. Instead the room went kind of quiet. No one was sure. The hyper competitiveness of the Coke-Pepsi dynamic, which I grew up with, was unknown to them. I tried jogging their memories by mentioning Michael Jackson strutting his stuff in a glittering black jacket, singing “I’m Bad.” Nothing. So I said: “Remember the ad, the one where Michael Jackson’s hair caught on fire?” They did not. And yet, to this day, retired executives at both beverage companies claim that the real reason why their brands achieved world dominance was, in the fighting words of one executive, “Every day we went to work, we went to war.” Had Pepsi and Coke not had each other, the chances that their brands would spread to more than 100 countries around the world would have been very slim. Pepsi and Coke are not alone. 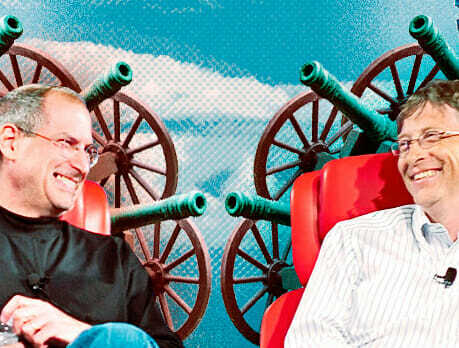 From the very beginning, the tech powerhouse Apple positioned their products in direct opposition to IBM. And when IBM no longer posed a threat, they took on Microsoft. At almost every opportunity Steve Jobs had to talk in public, he would subtly, and often not so subtly, run down his competition. Today, if we look at where IBM and Microsoft are in relation to Apple, the results of that tactic (among many others) pretty much speak for themselves. But what happens when the enemy is no longer? It’s hard for Apple to continue claiming its underdog position. Those “I’m a Mac, and I’m a PC” commercials have lost their relevance. No one is about to identify with Apple as an underdog since the company has become the biggest and, arguably, the most powerful brand in the world. Ironically, Samsung is now mimicking the Mac-PC tactic but targeting Apple. And in yet another twist on the same idea, Samsung has become the largest cell phone manufacturer, outstripping both Apple and Nokia. Nokia, for its part, is now playing the underdog to a degree, with ads that seem to take on Apple (and maybe just about every other smartphone to come before the Lumia 900). While speaking with the kids who were too young to remember the Pepsi-Coke wars, I realized that it’s important for a brand to keep the focus on their enemy in the public arena. That passionate opinion that people once held for either Coke or Pepsi in the 1970s and ’80s has faded from consciousness as the enmity melted into oblivion and both brands thrived. As I consult with brands across the world, I always ask the executives about their main competitors–in other words, I ask them to name their enemies. They all have at least one. However, when I ask them how “public” their enemy is, the conversation generally stalls. Many executives have become afraid of offending anyone. But the truth is, this is exactly what I think they need to do: offend their enemies. It’s interesting to note how some of the biggest, most grand events and organizations in the world revolve around competitors and competition. Think about religion and sports. So many different kinds of scenarios can be attributed to an us-versus-them mentality. As human beings and social creatures, we are hardwired to congregate in groups. Our groups share opinions, friendships, and enemies. The more polarized we become, the stronger we feel a sense of belonging, and the more assured we are of our place in space. Imagine going to a football game and vacillating about which team you support. Chances are the real fans of both teams would shun you. “You’re either with us or against us”–a very useful phrase for momentum building and crowd growing. In the rent-a-car wars that began in 1962, Avis positioned itself as No. 2. This allowed it to claim the underdog spot, permanently, and constantly aspiring to be better than the market leader. Its slogan–‘We try harder”–became the cornerstone of the company, and it’s maintained this position ever since. In 2012, it’s still at it, working harder to be the best. As the corporate world becomes slicker and savvier, and as the legal and compliance departments desperately try to protect their role, the competitive edge once witnessed (and enjoyed) by brands and their fans around the world seems to have faded away. But is this really the best strategy to pursue? Or would it perhaps be better to name an enemy and put the brand on the line? Yes, it requires courage, determination, and a fierce focus, but aren’t these the very ingredients that successful companies are supposedly made of? As my conversation with the teenagers came to an end, one kid came up and asked me, “So, who is Coke’s enemy?” I told him to guess. After a few thoughtful moments he said, “Tap water.” He had a point, but if I were a Coke executive, I sure would’ve wished he’d named Pepsi.